Spokane Civic Theatre made two big announcements last week. First, the selected plays for the 31st Playwrights’ Forum Festival, which highlights new one-act plays, 30 minutes or less, by playwrights across the region. This year’s festival features: “Cutting Edge Beauty” by Dacey Else, the youth division winner; “Eggs Over Easy” by Rich Rubin; “Hell on Wheels” by Jean Hardie; “Meta” by Civic’s playwright-in-residence Bryan Harnetiaux, a non-competitive entry; “Mother’s Day” and “The Sitting” by Pamela Kingsley; “Puppies and Kittens” by Barbara Lindsay; “Streamliners Across America” and “The Green Light in the West” by Paul Lewis; and “The Great Fish and Jonah” by Matthew Weaver. The festival will be June 20-23 in the Firth J. Chew Studio Theatre and is performed in two separate sets on alternating days. Tickets are $15 and are available through the box office and www.spokanecivictheatre.com. Second, Civic has announced the lineup of its 2019-20 season. The main stage season will kick off with “Matilda: The Musical” in September and October, and “It’s a Wonderful Life” in November and December. “A Gentleman’s Guide to Love and Murder” will be produced in January and February, followed by “The Humans” in March and April and the musical “Funny Girl” in May and June. The studio theater season begins with “The Book of Will” in September and October and “This Is Our Youth” in November and December. The season continues with “Present Laughter” in January and February, the musical “Cabaret” in February and March and “Exile” in April and May. 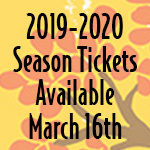 Season tickets are on sale through www.spokanecivictheatre.com.